Hey Wastelanders! My rules for Radiation Healing and Chems are now available on the D20Radio site! 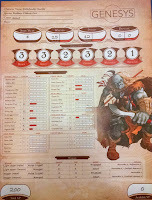 A full article will be up on the D20 Radio blog in a few days, but for those who follow me here the content is available for you now. Enjoy, keep that rad-count down, and watch out for chem addiction! 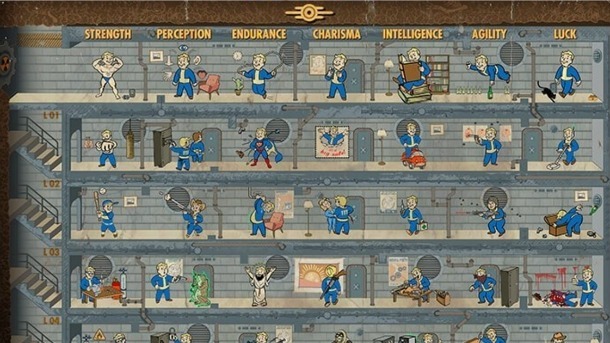 And for anyone who needs it, you can find the original Fallout Theme document here! I've been working on several projects for Genesys lately (in between the usual insanity of the holiday season). Most of them are for Fallout, but some are for my City of Heroes theme, as well as the Wizarding World module I'll be running at GamernationCon 5 in April. 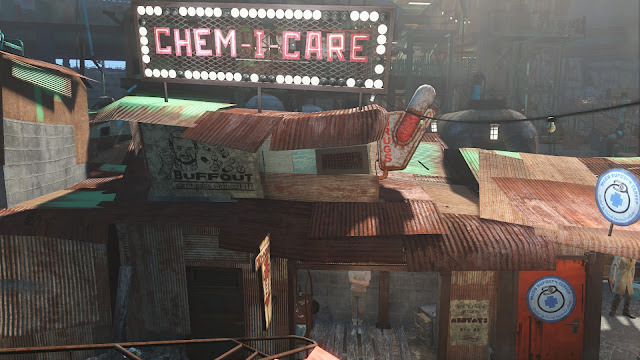 For Fallout, I've done some work on Chems, finally wrote up the rules to heal radiation damage with the Medicine skill, and started to outline some new talents tht are taken from Fallout 4's Perks list. Using Jet will grant the character an extra turn at the end of the round. This additional turn does not count as the character's next turn for the purposes of talents and effects. Characters addicted to Jet increase the strain cost of any non-free maneuver by +1 and suffer a setback die to all Agility checks when not under the effects of Jet. I'm hoping that the downside and one-shot nature makes chems useful in certain situations, but not game breaking. Feedback will be necessary and updates may occur. I love the idea of Bloody Mess, but I'm having trouble figuring out exactly what it could do in Genesys, other than just "MOAR DAMAGE". It's going to require some additional thought. As far as what else is coming for the Fallout Theme, I have more weapons and equipment coming, along with more adversaries, attachments, rules for establishing settlements, and scrapping/crafting rules. Some of these will be pretty direct adaptations from similar rules in the Star Wars RPG, but there will be some differences. 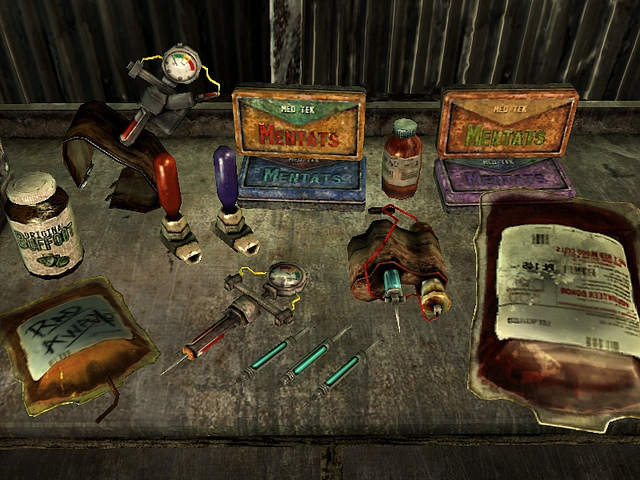 They can't port over directly, and do need some tweaking to fit into the Fallout world. I figure these tasks should keep me pretty occupied over the winter months. It should hopefully distract me from starting some more Theme adaptations. A Rifts theme is really itching to get some attention, but so is a Battletech theme. A poster on the FFG forums is working on one but it feels too much like he's trying to make the Battletech rules fit into Genesys; which is not a direction I would take with it. If I work on one, my direction will be "how to play Genesys in the Battletech universe"; trying to capture the essence of the setting without it getting too bogged down in complex rule adaptations. ...and now my brain is working over how I'd do it; I'm hopeless. Ah well. Something to toss on the growing pile of stuff to work on later. It's November 30th, the official release date for Fantasy Flight Game's newest game, Genesys. I've been raving about this system since it was announced, and am excited and pleased that this date has finally arrived. Not only because it means I'll soon have my hands on a physical copy of this wonderful game, but also because I can finally share my latest evolution of "Edge of the Wasteland", my Fallout hack for Edge of the Empire that I wrote back in 2015. 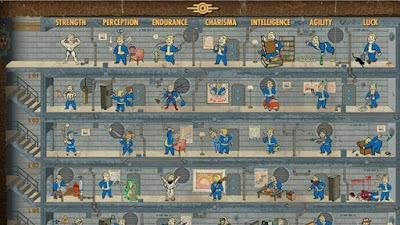 Over on the D20 Radio blog is my latest article along with a link to my 20 page Fallout Theme for Genesys. Head on over to D20 Radio and check out the article there, and be sure to download a copy of the theme for your personal use. I've been working on this document for months, testing it and tweaking it. I'm pretty proud of the final product, and look forward to adding to the material over the next few months. More importantly, I'm interested in hearing back from folks who use the theme and their experiences with it. Naturally, I'm eager to throw this down in front of my own gaming group and get more adventures in the wasteland going. So here's to Genesys and a big congratulations to Sam Stewart and his team at FFG! Thank you so much for this game and I'm looking forward to running many adventures with this tool-set. Some folks know that I was a playtester for FFG's Genesys RPG system. Heck, it was my Fallout hack for Edge of the Empire at GamerNationCon 2016 that helped kickstart the idea in Sam Stewart's brain in the first place. 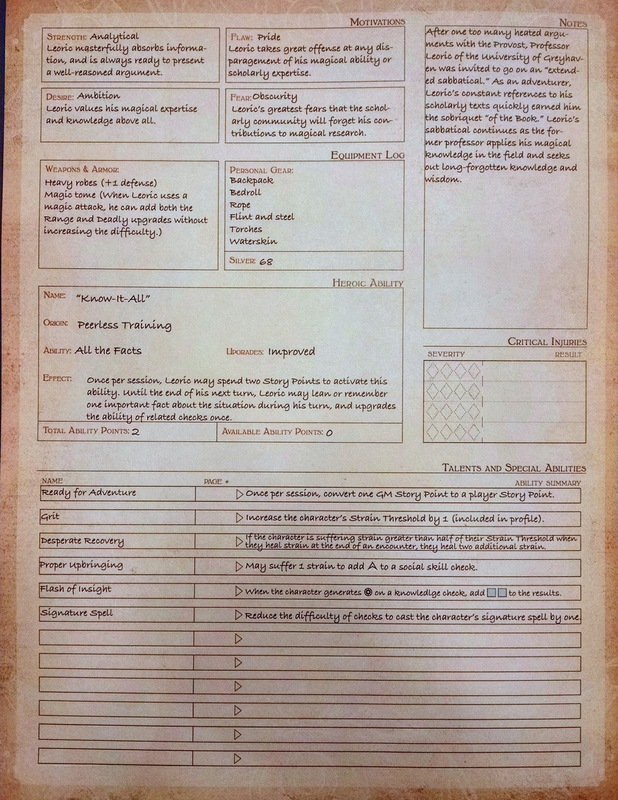 Since the playtest, and having access to the Beta Rules and formats for these things, I've updated my Fallout: Edge of the Wasteland rules to conform with the Themes format in Genesys. That theme is 99% ready to go, and will be shared to the masses the moment the book starts falling into the hands of it's fanatical followers. Since Genesys was updated to "at the printers" on FFG's "Upcoming Releases" website, it seems like we might get the book before Christmas. Hopefully January at the latest. 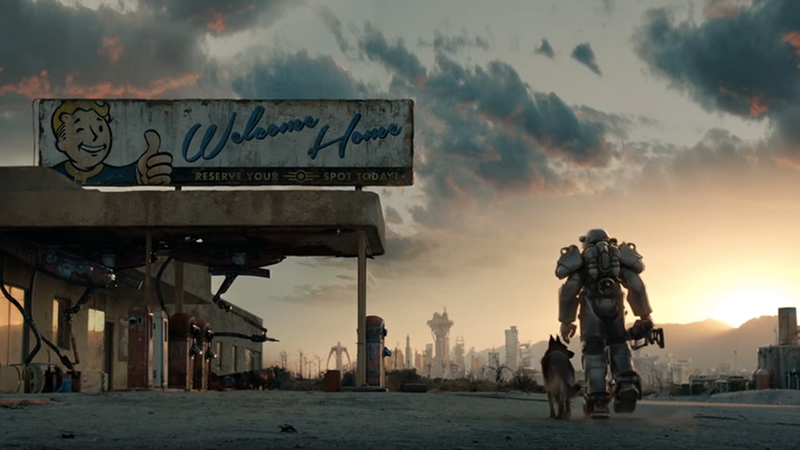 When it does drop, my Fallout Theme will be accessible here and on the D20 Radio Blog for everyone's enjoyment. With that project just about done, I've been pondering other themes to work on and hopefully have ready for "the gamer nation" when Genesys hits. I'm helping out with a Dresden Files and Wizarding Worlds theme, but I wanted another project for myself as I undergo cancer treatments and recovery. Some of the current frontrunners are G.I. Joe, MASK, Rifts, and Robotech. I'll probably get to those eventually, but there was one theme that has risen above all others and begs to happen sooner than later. So, hopefully by the time Genesys drops in December (January? ), gamers will be able to adventure not only in the wastelands of the Commonwealth or the Capitol Wastes, but also speed, soar, or swing through the urban canyons of Paragon City, dispatching villains and criminals of all four-colored flavors. Stay tuned, and may the dice be with you. 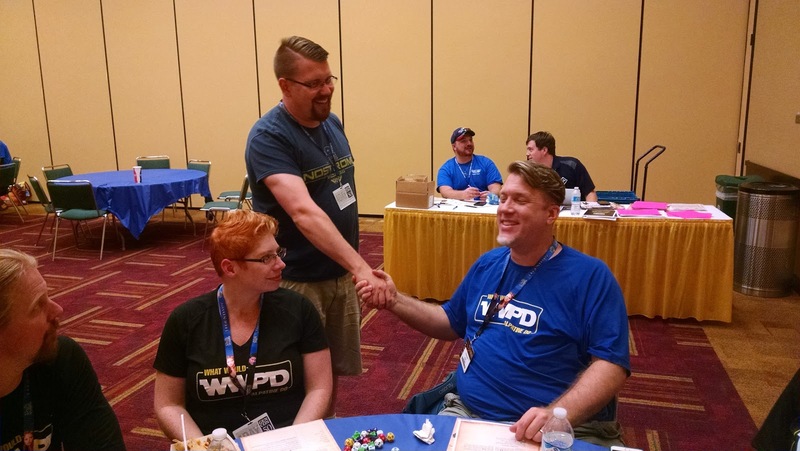 Review of "The Haunted City"
This August I had the opportunity to go to GenCon 50. 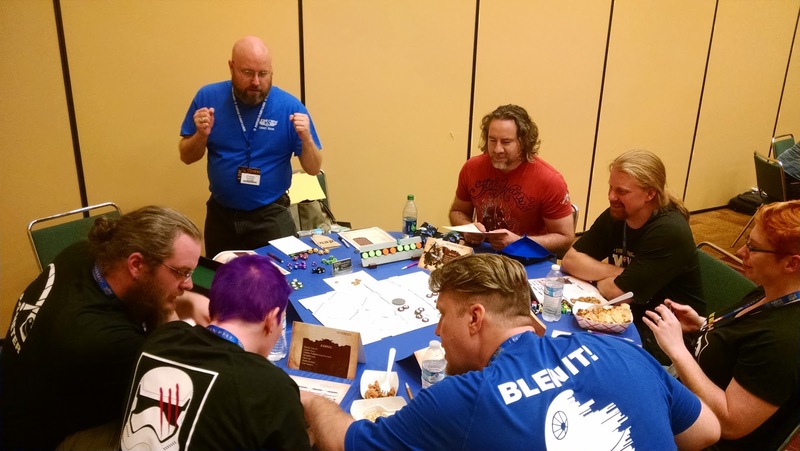 Not just to attend, but also to run games for Fantasy Flight Games. It was a wonderful time and an amazing experience; "10/10 would do again" to use the phrase. With one exception, every session I ran was for Genesys, FFG's new generic rulebook based on their Narrative Dice system. 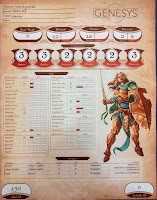 It occurs to me that I never did any sort of post-GenCon commentary or review of the module, the system as presented, and my thoughts on it all. The adventure is called "The Haunted City", and was written by one of the many "Tims" of FFG (Tim Cox if I remember correctly). The adventure is set within FFG's Runebound setting of Terrinoth. It involves a murder investigation that ends in Nerekhal, a fortified city with a sordid past of being a nexus of infernal power. There's a possibility of folks to play this module in the future, so for now I won't go into too many details about the plotline so as best not to spoil it. First up are the characters; they're a motley bunch of named heroes from Runebound; Alys Raine, Syndrael, Leoric of the Book, Thaiden Mistpeak, Pathfinder Durik, and Ulma Grimstone. Experience-wise, these were some advanced characters; they had 190-210 XP in addition to their starting XP. 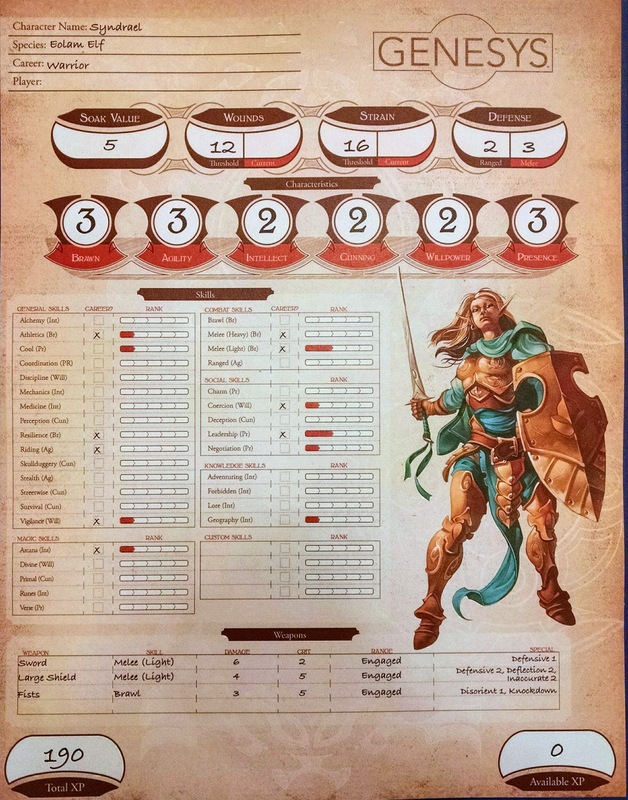 This gave them a host of skill ranks, a bevy of Talents, and each of them had a Heroic Ability (something that's akin to Signature Abilities for those familiar with the Star Wars RPG, but not quite as powerful). Most of the characters were seemingly really fun to play, I didn't have anyone who came up to me afterwards with comments that their character felt lacking. My only real criticism about the characters are that they had a huge amount of abilities and options to choose from. Since the system is still technically in closed Beta, it doesn't allow for anyone to really have any familiarity with the talents presented. I know that only one person ever used Thaiden's "Wraithbane" talent, preferring to use his crossbow in just about all situations. Several players mentioned that they forgot or didn't realize they had certain options, probably due to the wide variety of them. However, I can say that pretty much everyone did find the "intended combos" for each character; Alys is able to absolutely smash eveything with her Warhammer, and then layer on even more damage with her "Justice of the Citadel" talent. Each character also has Strengths, Flaws, Desires, and Fears. The idea behind those mechanics are for situations where these qualities would be a benefit, they add Boost Dice to the roll. For situations where they would be a detriment, they add a Setback die to the roll. Since this was a new mechanic and concept even for me, I actually missed having that come into play more often. Also, unlike the Obligation/Duty/Morality mechanics in Star Wars, every character has 4 of these qualities to keep track of. It was a little daunting, and I probably missed several opportunities to influence the game with these abilities. Still, it was handy to have them, and just about every player of Durik was shying away from the truly supernatural threats and challenges in the module. As I mentioned before, each character had a Heroic Ability, something new that looks a lot like Signature Abilities in Star Wars. 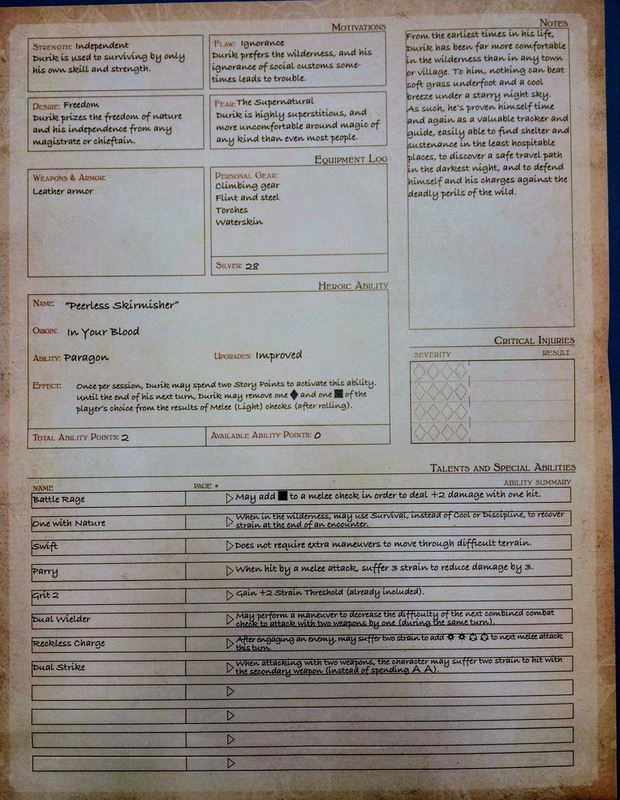 The ability is spelled out with a few descriptors such as Name, Origin, Ability, Upgrades, and Effect. There also seems to be a tracking for Total Ability Points earned, and Ability Points available. Presumably, one will be able to earn Heroic Ability Points and spend them on a variety of effects. I really like Ulma's ability to simply activate (for 2 Story Points) and take an Incidental action to defeat an entire minion group within short range. Every group had her use this to great effect in the module. It basically lasts for 2 rounds, which seems appropriate. One of the biggest questions before and after GenCon was how magic was going to work. Is it skill based? Do you buy spells like you do Force Powers in Star Wars? How are spells cast? How are they designed? Is there a list or something? The public got their first glimpse at Spells thanks to Alys and Leoric. Spells are, in fact, skill based, with 5 different schools to chose from; Arcane, Divine, Primal, Runes, and Verse. We only got to see Arcane and Divine in play with this module. Alys was limited to one spell per encounter, while Leoric could toss spells all day long as long as his Strain holds out. Casing any spell costs 2 strain, which is a pretty good balance point to help reign in mages. Leoric's signature spell can hammer an opponent for 9 damage at medium range, and crit them for a +30 on the Critical Injury table for only 2 advantage; and he could do that every round. I did have one player nearly knock himself unconscious during one particularly nasty fight thanks to taking a lot of strain, so it works pretty well. 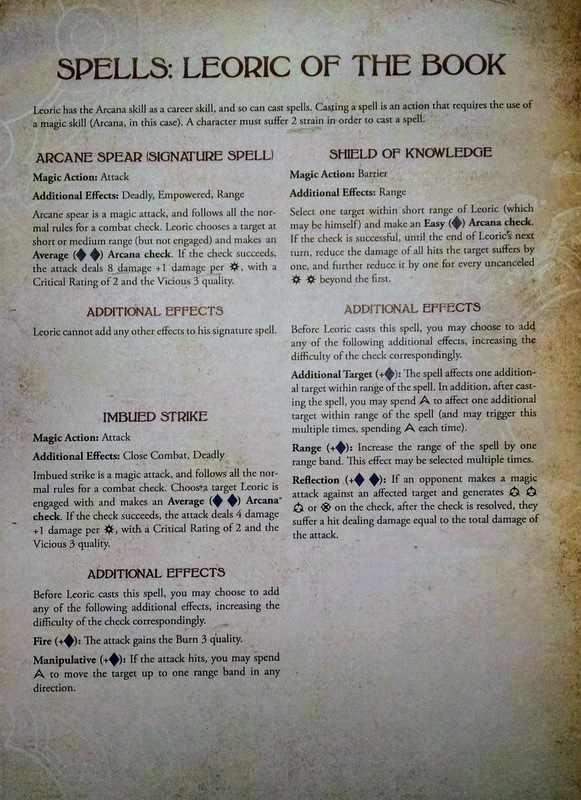 Each caster has a few spells to play with, with no real insight as to how spells are acquired (yet). The spell outlines the effect, and the difficulty to cast it. With the exception of Leoric's signature spell, each spell has a list of additional effects they can layer on to the spell at the cost of increasing the casting difficulty. Some spells can take additional targets, or increased range. 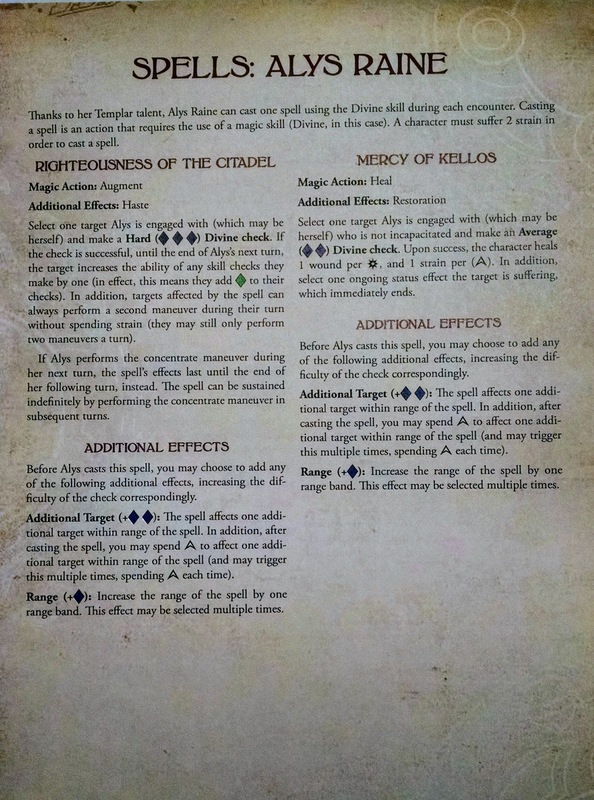 I really like the way the Developers handled this, it makes the bigger flashier spells able to be cast at all levels, but you definitely want to be a skilled (or Intellectual) caster if you're going to increase the difficulty of the spell to 5 purple difficulty dice (a Formidable difficulty). The last details that were included were updates to how Defense works. It used to be a complex chore to figure out if certain effects or qualities added to defense. In Genesys they simplify it to "granting Defense" or "adding to Defense". Some armor grants Defense, a new base line for other effects to add on top of. Cover also grants Defense, so it doesn't stack with armor. The Defensive weapon quality adds to defense, and there's no limitation on how many sources of Defensive you can benefit from. This meant that Syndrael became a true tank, able to get a Defense of 3 thanks to her Sword (Defensive 1) and her Large Shield (Defensive 2). Aside from this, the rules played pretty much the same as Star Wars. "The Haunted City" was a fun module to run, full of twists and turns and unique, well thought out characters for the heroes to interact with. It's a somewhat rail-roady adventure, but for a convention module that's supposed to fit into a 4-hour time slot, it's understandable and forgivable. 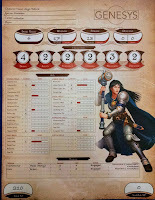 Even so, if you're not careful the players could turn the adventure into a 5 or 6 hour adventure, which is great if FFG releases this for others to play in their own homes. Sam Stewart and his team have made a winner here. I'm really looking forward to Genesys hitting the shelves, and finally being able to talk about all the things I can't talk about right now. Until then, we at least have these bits of insight into Genesys to gnaw on. Welcome to the first of what will hopefully be a series of articles that talk about gaming maps and diverse uses for them in your games. It's no secret to anyone reading this blog that I'm a huge fan of Christopher West and his Maps of Mastery store*. 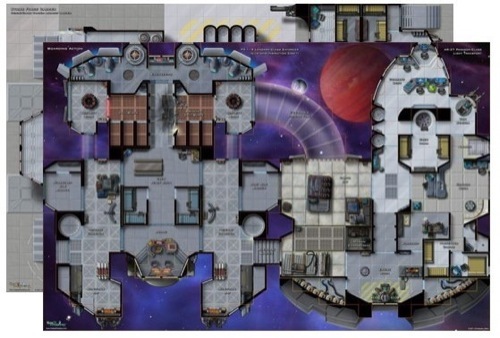 Chris has been working in the gaming cartography business for over a decade now, and has produced several beautiful maps for the Star Wars Miniatures game. More recently, he's taken many of those themes, made them more IP-generic (i.e. filed off the Star Wars details), and expanded his catalog of sci-fi (and fantasy) maps. What we have now is an ever growing resource for maps suitable for gaming in a variety of settings. So what is the point of this series? I really enjoy Chris's maps, and I haven't run a game session in recent memory where I haven't used at least one of his maps. They're diverse in their usefulness, some more than others. My goal is to pick a specific map from the current Maps of Mastery catalog and showcase some neat ideas and scenes that it can be used for. I'll try and go through as many unique ideas as I can from a variety of settings; fantasy, steampunk, historical/weird war, modern, and of course sci-fi (...interesting list, huh?) I want to give my readers a resource for using these maps in scenes and encounters for their games, as well as provide a challenge to exercise my own creativity and try to come up with outside-the-box scenarios and stories for these maps. Today we're going to start with one of Chris's earliest maps (of Mastery! ), the Offworld Shipping Center from his Mass Transit mapset. It's a classic, glorious map, with rail cars, cargo bays, control centers, hazards to play with, and even a neat shuttle laid out in the landing bay. The map connects to other maps in the Mass Transit series in a variety of ways, allowing GMs to make truly huge areas for the players to stomp around in. But what can we do with this map, by itself? As far as utility goes, Chris does give many of us access to overlays for his maps, especially .pdf copies of them. We get an overlay to remove the shuttle and make that an empty landing bay, for instance. With some of the other Maps of Master products, we could leave the bay empty or throw in some more barrels and crates, or a different vehicle, or even turn it into another command and control center. Speaking of control centers, we've got a nice little cluster of terminals and displays in the center of the map. 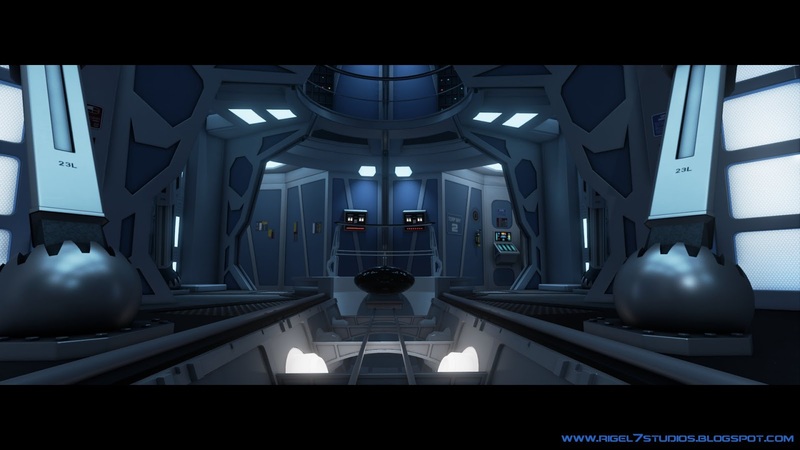 This is an optimal location to control all aspects of the map's mechanical mechanisms; retractable bridges, security fields, locked doors, cargo cranes, even turbo-lifts could be controlled from these stations. There is a second control station just outside the control center. This leads into the landing bay, so it's optimally used as a security checkpoint that anyone who arrives has to approach before access to the rest of the facility is granted. The orange light on the wall could be used as a weapon or other scanning device, letting the person behind the protected glass know if the person is carrying weapons, or is human, or whatever the device is scanning for. This security station probably has access to locking and unlocking access doors on the map, and maybe control of the fuel depot. There are two other wall terminals on the map too, one down by the security gate across the railway, and another in the upper left near the south entrance to the fuel depot. If the GM wants these to actually be used, they could be utilized in a more local means to interface with the main computer for the map (if networking is a thing) or individually to operate the security gate or lock down the fuel depot. The depot has a lift, which those controls just outside the room could control. That's the layout, now let's talk about what you can do with this map in any given setting. Fantasy: Okay, we probably can't do anything with this map in a fantasy setting...or can we? This map is actually pretty useful for a city or fortress in a fantasy setting that could allow for such a thing (Eberron comes to mind). We'll say that this is a section of a dwarven fortress, one that is moving valuable minerals from deeper within the mountain to transit points where they will either be smelted (ores) or sorted (gemstones). It works better if we use the empty landing bay to remove the shuttle from the pad, but everything else works fairly well. The control center isn't really computerized as much as it is a series of records and bookkeeping files that outline productivity within the mines or possibly even troop disbursements for shipments elsewhere in the kingdom. Elevators become closets or storage rooms where weapons and supplies are kept. The fuel depot stores water for animals or possibly even alchemical substances to power artificed devices used for transportation. The railway can be used as-is, if there's ever a race in fantasy that would use rail-cars, it's the dwarves (or gnomes, I suppose). The security checkpoint is magically warded, with scrying sensors that detect magic, races, and illusions. Game Use: Your PCs may need to infiltrate the fortress or mines by sneaking in the cargo holds, or bluffing their way past the security checkpoint. They might not be looking to get into the fortress any further, maybe they need something from the bookkeeping center, such as maps, schedules, or inventories. Maybe the bookkeeping center is the objective, and there's a magical scrying crystal that someone wants the PCs to steal for some nefarious scheme. Steampunk (and Weird War): For this we have Dr. Fornazio's Aeronautical Cargo-dome! Various airships, gyrocoptors, and rotor-planes from shipping companies and privateer fleets utilize the Cargo-dome to transfer goods ans services. Built into the side of the Rockies, the various aircraft arrive at the landing bay where they offload their cargo. Servicemen and specialists who work for Dr. Fornazio secure the cargo in two holds near the landing bay, while the pilots of the craft check in with security. If their ship needs fuel, it can be arranged for at this time. After a brief waiting period in the cargo hold, the goods are moved to a steam-powered train system that carries the cargo into the mountain to be secured in protected vaults. Game Use: A Steampunk adventure could include raiding the Cargo-dome in hopes of securing an item from the cargo hold before it can be moved into the more secure mountain vaults. Perhaps the fuel depot is the target, and a hopeful independent freelancer sees the Cargo-dome as a prime target for theft of petroleum (or whatever your world's aircraft are powered by). Maybe the objective is deeper within the mountain, and the PCs need to defeat the evil Dr. Fornazio's Elite Security Magistrates to gain access to the inner vaults and the even more deadly dangers within! Modern/Sci-fi: I'm going to try to come up with something different here. This isn't an Offworld Shipping Center; it's a missile loading bay on a warship. Missiles are loaded from a secure hold off the right side of the map along the tram-line. The freight cars are actually missile packs or even giant torpedoes, that are configured before launch in one of two preparation bays (the Cargo Holds). Once the missiles are ready to launch, they are moved along the track to the loading cranes, which can move along ceiling-mounted trams to either of the two launch tubes along the left side of the map. The Control Center is the master loading system and fire control station for this particular launcher. In such a scenario, I'd make the landing bay the storage bay for additional munitions and armaments. Game Use: PCs might have to infiltrate this section of the ship to place explosives of their own, or prevent a missile with a bio-weapon from being loaded and fired from this launcher. Either that, or they're on defense, trying to prevent enemy saboteurs from destroying this launcher (and possibly the whole ship). So there we have it; the first of my "Mapping the Scene" articles. I hope you find it useful, or at least entertaining. I know it certainly helped me look at this map in a different light, and increases the odds that I'll use it in the future for a variety of games. *- One final note; Chris West is a phenomenal artist, cartographer, and gamer to follow. In addition to his Maps of Mastery storefront, Chris is also on Patreon. Currently, anyone who supports him on Patreon is receives a series of exclusive maps on a monthly basis. As of now he's giving us various tiles for a modular-configured Starship (which is 3 months away from being officially finished, but you could always reverse the image on a few tiles and have a complete vessel now). Maybe I'll take a stab at drafting up Star Wars RPG stats for this and a few other vessels Chris has designed and laid out on his various maps. Final post in the series, so let's make it a good one! Day 30:What RPG genre mash-up would you most like to see? I had this idea a while ago for a mash-up of Fallout and Robotech; the Zentraedi and Invid Invasions happened, but a section of humanity survived by isolating themselves in Vault-Tec vaults. It was a quirky concept I could never get much mileage out of when I tried to actually flesh it out. Beyond that, I'm still trying to get my Fantasy/Space Opera game up and running; Anomaly. It sounds like it will fall into a similar vein as Starfinder, but I'm obviously trying to make it unique and my own. I've got several worlds plotted out, several major events planned, I just have to decide how it all comes together. That's a pretty loaded and complex question to answer. First, I'm expecting 2018 to be the year my two Renegades games come together. The two three-man parties will have played out their time, and hopefully decide to fight against the Empire in the Tantra Sector. Hopefully I can get that game going on a regular Bi-Monthly schedule. I'm looking forward to getting more time in on my character in my buddy Tim's Star Wars game. I enjoy playing a PC, and want to get some more time at the table as a PC. There are conventions that I want to go to; GamerNationCon 2018 is going to be a hoot, because it's going to be Harry Potter themed (or at least magic-themed). 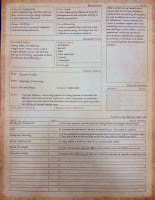 GM Chris and I are planning to write modules using FFG's Genesys system; his at Hogwarts, mine at Ilvermony. I almost have to bring a Fallout module down there too, but do I write a new one or create a third module? And do I bring down a Star Wars module to run as well? At that point I might be diluting my time too much, and should probably stick with only 2 modules to run. Then there's GenCon 51, where the organizers from FFG have already sent out the "we hope you can join us next year" email. We'll have to see about that one; I'd love to do it, and had a great time running games for them this past year. Mostly about time and airfare. Now aside from all that, my big focus for 2018 is going to be freelancing. I've lived with too many regrets, and I'm going to do what I can to stop living that way. One of my bigger regrets is never really taking a chance and a risk at writing for games. I've formed a lot of contacts at various points in the industry, and have friends who are willing to critique my work in the hopes of making it better. I'm going to spend 2018 working on my own writing, my blog, and improving my writing style in hopes that someone is interested in my work. 2018 is a year I'm hoping for positive change, but it's not going to happen unless I put in the work for it. And that's it, I suppose. This has been a fun, if disjointed exercise. These were a fun series of questions to answer, and really made me think back to some classic times in my gaming history. Going to play catch up with these two brief questions. It would be foolish to say anything other than Star Wars; probably because I run a lot of Star Wars and the classic lines have a high re-use value. "But I was going to go to Toche Station to pick up some power converters!" Day 29: What has been the best-run RPG kickstarter you've backed. All of Chris West's Maps of Mastery kickstarters are very well done. I'm amazed at his ability to get a Kickstarter done in a week, have it almost completly fulfilled, and print off all the maps in a couple of days in time for GenCon. It's crazy. Aside from that, the Rifts for Savage Worlds kickstarter was very well done, it's fulfillment schedule was spot on, and was handled very professionally. It also turned out to be a really fun game to boot. I couldn't back it anywhere near the level I would have liked to, but I was able to get some digital copies of the books, and they're wonderfully crafted. With recent developments this week I find myself at home with some time on my hands. I've got 5 days of these things to do, so let's bang them out. I've got three that immediately leap to mind. First, minis. I love minis, and the way I run games (especially Combat) it's highly important to me and the players around my table where folks are at any given moment. 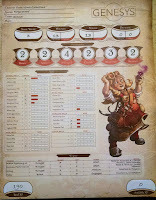 I've used simple tokens in the past that had the Character's first initial on it (Which was a real pain when I had a bunch of "A's" in the party...), but as time went on and the variety of minis became more widespread the potential for truly unique and personal minis became possible. The wide variety of minis that came from the Star Wars Miniatures game from Wizards of the Coast gave me pretty much any figure I needed for a PC or major NPC, and if I couldn't get one exactly correct a suitable mini was only an Xacto knife and some Green Stuff away. Hero Forge took it to the next level with their online design program, thousands of options for parts, and their ever improving line of materials to print 3D minis in. They're pricy if you go for the high detail plastic, but if you need a mini for one character and plan to use if for years, it's a solid investment. Next to minis is maps. You've got these things, the next progression is to enhance the look of where the minis are arrayed on the field of battle, and what obstructions or opportunities there are lying around to exploit. I'm a huge fan of Chris West's Maps of Mastery line of maps. He's made a wide variety of excellent sci-fi maps over the years, along with some fantasy ones that can perform double duty too. In the last 10 years I have yet to run a session of any game where one of Chris's maps hasn't been used. 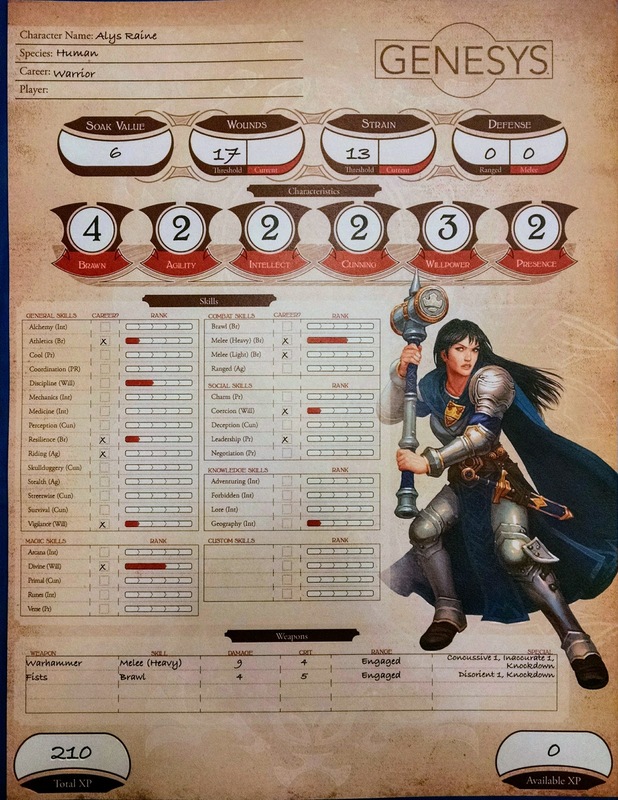 Finally, an initiative tracker. Roll20 has their online tracker that works just fine, but for table games I like my Alea Tools Initiative Board that they kickstarted a couple years back. It's really just a foot long metal plank that you can stick their magnetic tokens to, but it's elegant in it's simplicity and works wonderfully. It's too bad these haven't been made available to the general public. The did a kickstarter for them a few years back, and haven't made them available on their website. Which is a shame, because folks have asked me where to get one anytime I run a game at a convention. 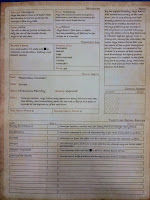 I missed posting yesterday primarily because I was running an RPG. Good times. I'm going to take this to mean they're talking about game lines that had extra items that can be used in play. I'm going to have to go with the Star Wars RPG from Wizards of the Coast. WotC had this marvelous cross-support for Star Wars. The gaming books usually had a couple good maps in them, either as ground locations or as ship deckplans. 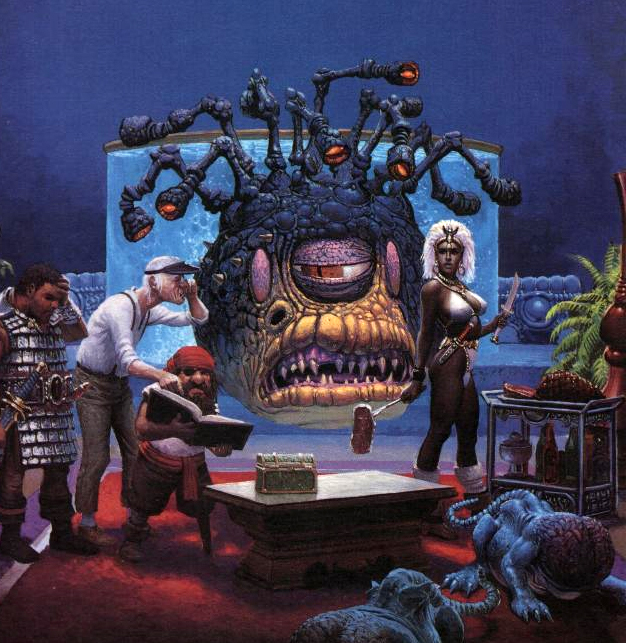 Their Miniatures game provided hundreds of minis for a variety of PCs, NPCs, and opponents. Starship Battles gave gamers all the ship minis they could want to plot out dogfights or captial ship slugfests. And all lines gave us a variety of exceptional maps from Christoper West, who has turned it into a career over at Maps of Mastery. FFG's Star Wars RPG Beginner Boxed Sets come in a close second, because each box provides useful counters, maps, and a set of dice. Get all four Boxed sets and you'll have plenty of dice to share and plenty of tokens and maps to play with. 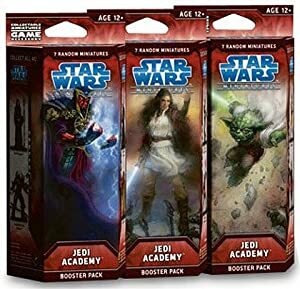 You can use Imperial Assault minis for characters, and X-Wing minis for space battles, but they're more expensive than WotC's models. For the price of one X-Wing miniature or one pair of Imperial Assault minis, you got 5-7 minis from WotC's packages. I'll work on today's in a couple hours. It should still be fresh enough in my mind from yesterday's game to practically write itself. We're in the home stretch, only one more week to go. And now for a total self-serving answer! Oh, a question near and dear to my heart; probably because I GM a hell of a lot more than I play. 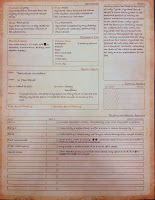 As a GM, I'm going to give you all some insight as to what I appreciate seeing or receiving when I run games. Show Up to Play: Obviously there's the literal definition; if we schedule a game, I appreciate it if you actually show up to the session. But beyond that, show up ready to get into game and get into character. I love it when the story can inspire folks to really get into the feel of the game, and into the session. Immersion is a wonderful thing to achieve. Look, I know some times you just want to show up and roll dice, and that it's hard to completely disconnect from life some days, but as long as the effort is there I'll see it and appreciate your efforts to at least share in having a good time. This also means helping to keep the game on-point. I get that we're playing with friends, and I'm as guilty of going on a tangent for the sake of a joke or a story, but the ability to bring it back to the game quickly can be a real savior. Logistical Assistance: There's a lot of work and effort that goes into running games, or at least there's a lot that can go into running games. 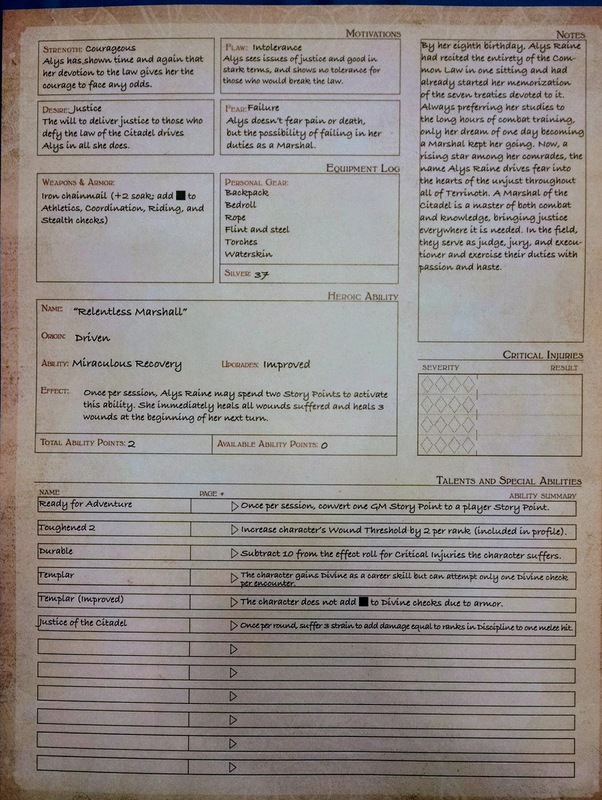 Some GMs are happy and content to sit down with a prepared module and adventure and simply run that. Other masochists, like myself, want to write a story from scratch, to weave in character backgrounds into the narrative. That takes time, but it also takes material to work with. I appreciate it when my players can create backstories I can work with, and that fit into the story. I do a lot of my campaigns on Obsidian Portal, so everything is written into a wiki on the page. 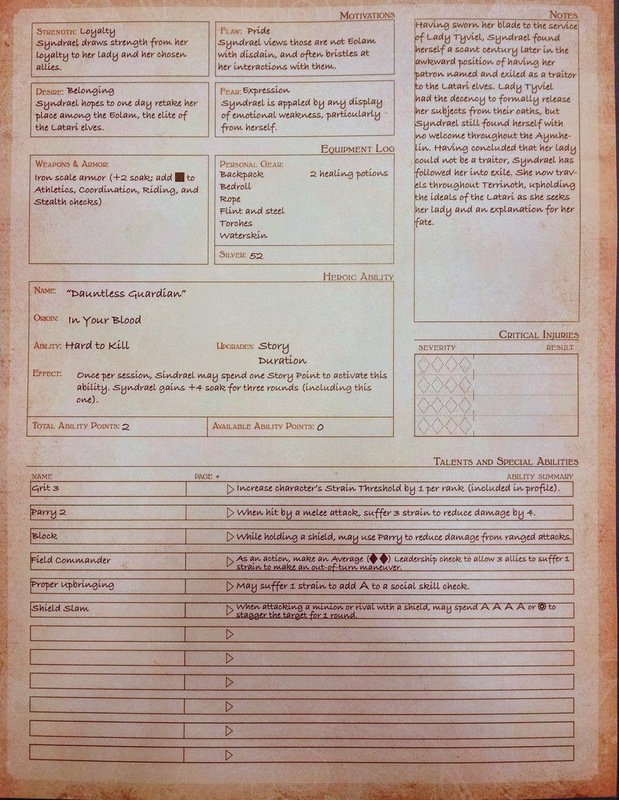 I reward my players who add to the game by writing up a summary of the adventure from their perspective. 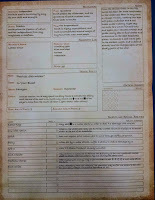 It helps me track what happened in which adventure, and what the story looks like from the player's perspectives. This is helpful because if the PCs missed something I intended them to see, I can take steps to correct it next session. Finally, yes there's the monetary support. Obsidian Portal is cheap, coming to about $5 per month, but paired with Roll20 that means I'm effectively paying $15 per month to game. I'm on a fairly tight budget these days. Fortunately several of my players happily chip in so I have the tools necessary to run games. Thank you: This is a big one, appreciation for the work and effort I put into these games. Trying to herd a group of 6-12 PCs is sometimes like herding catnip-stoned feral cats. Writing and gathering the supplies to run the game isn't always easy. Transporting said supplies to a place where I can run a game for 6 people is sometimes a pain. 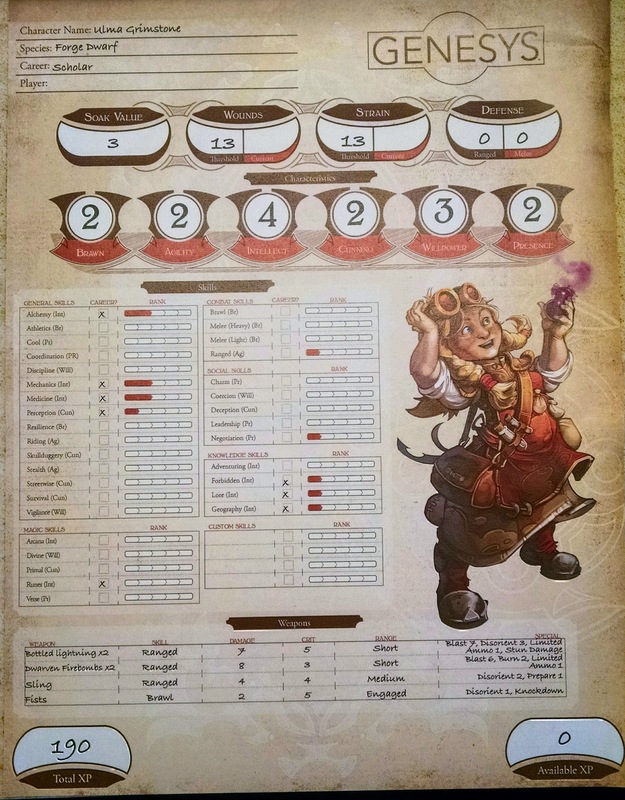 Running the game means trying to juggle running the adventure, combat encounters, adjudicating die rolls creatively and in fun ways, and portraying a dozen unique characters (at least). Nothing makes me smile more than someone afterwards telling me they had a good time. Criticism of any sort is welcome; if something didn't work then I want to know for next time. One of my favorite parts of GenCon was the fact that at every table, someone shook my hand afterwards and said they had a great time, that they thought I was a great GM, and/or that I made their convention. There are many ways to thank your GM, simple appreciation is perhaps the easiest one. How far from human do you enjoy getting the chance to be in an RPG? Longer Answer: One of the reasons I got into RPGs was to be something I wasn't. I enjoy playing the alien races, the odd ball characters. Some of my favorite characters from fiction aren't human, and some of them are very non-human. I enjoy the challenge of trying to be something alien, something that people can't always relate to. I find it to be a welcome challenge. It goes back to wanting to be different, but in a special way. One issue has been that I tend to be a gamemaster, not a player. Those rare times I did play? A Kel Dor Jedi Knight as my RPGA Living Force character. An Ithroian Jedi in Star Wars Saga Edition. 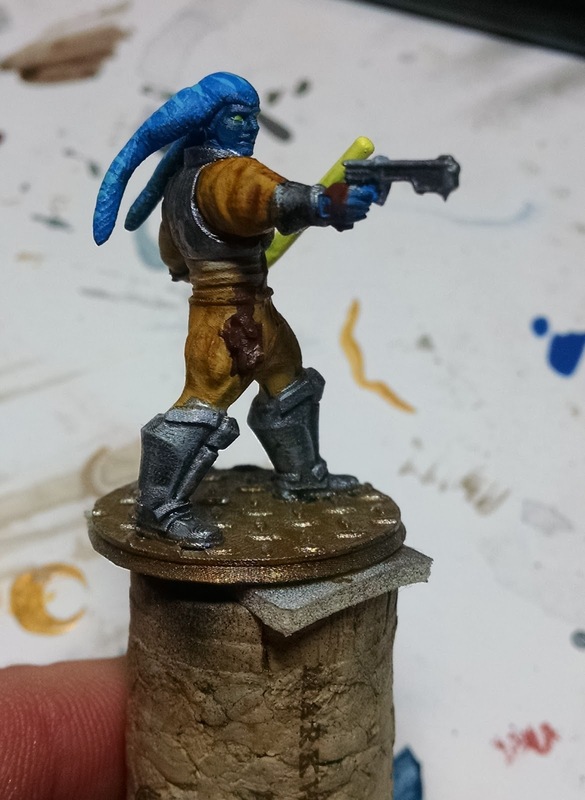 A Twi'lek in FFG's Star Wars RPG. 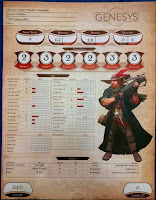 A Dog Boy Glitter Boy Pilot in Savage Rifts. I don't say I never play humans, but generally speaking give me a party of humans, and I'll likely be the one looking to play the most alien among them, mechanical stats be damned. Looking at tomorrow's question, I foresee that my answer may be a little self serving. Still, it should be fun to write up. Answer: Palladium Books. The whole line, at least up until the mid-2000s. Those of you who have any of the old Palladium books books prior to 2005 will notice that the layout there in was a bit...odd. I could never put my finger on why it bothered me so much; the layout was incredibly simplistic, artwork was reprinted regularly and in a way that hinted the image was a copy of a copy. I didn't really now why until several years ago when I read a recount and criticism by Bill Coffin on Kevin Siembeda's design practices. Bill's recount is rather colorful and laced with snark, but it did give me insight as to why I was bothered by it all. Once Kevin's ready for layout, he prints out the whole mess and fires up his wax machine because he still puts these damned things together by hand. What's that? Desktop publishing software? Naw, he's faster without it! To his credit, he lays out the book in fairly decent time, but he also illustrates why all Palladium books have a simple two-column format. Kevin isn't going to cut columns to shape or deviate from formula because he might have to reflow a section of the book, and when he does, all those columns have to be standard or else none of it works. Where this really makes you want to bang your head against the tip of an artillery shell is when he lays out 80% of the book, discovers that he'd like to rename an alphabetically ordered item on page 5 and decides that it would be too much work to reflow the rest of the list. You know how every so often in a Palladium book you'll have a series of NPCs or OCCs or something and one of them is grossly out of alphabetical order? That's why. I used to think it was because Kevin couldn't read the alphabet. Now I know it's because he's truly, madly, deeply in love with putting books together in ways that even Monty Burns would decry as old-fashioned. Now, admittedly a few years after this post hit RPG.net, Bill issued a public apology to Kevin and they seemed to have buried the hatchet. 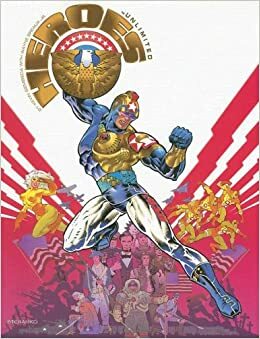 But still, if that was what was going on with Palladium back in 2003, it certainly explains a lot of the issues I had with the layout of the various books from that company. This post always stuck with me, and every time I crack own a product from Palladium, even a modern one, I have to wonder if it was laid out by hand on a light table. Tomorrow's question is going to be tough...probably because I don't think I've ever used a game from a Pay What You Want publisher. Now that we're caught back up, let's keep this train a rolling. 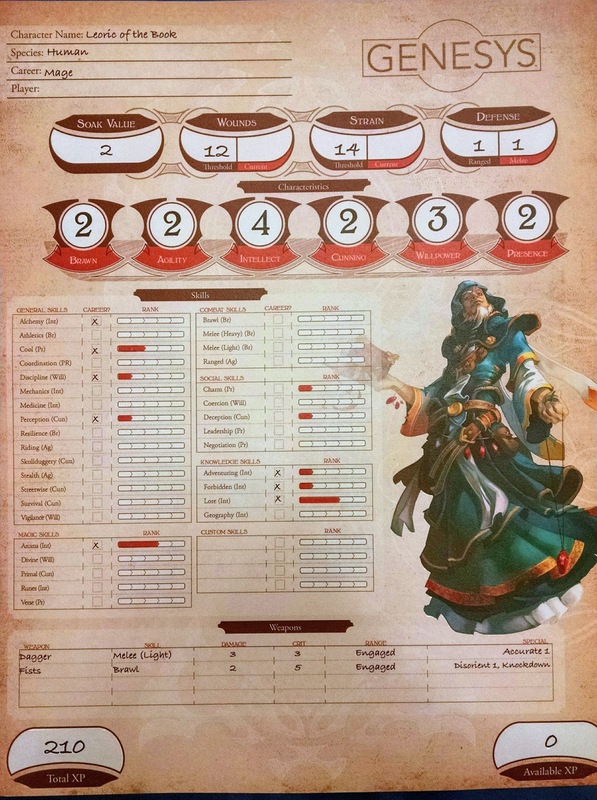 Any RPG I'm incredibly familiar with that doesn't force me to reference a massive amount of charts to run. I really enjoy running FFG's Star Wars RPG because generally speaking I only have to look up Critical Injury results when someone scores a critical hit. Otherwise I generally don't have to look up most of the tables. I know by extensive practice what you can do with 3 Advantage, or 2 Threat. I know how much damage a blaster pistol does, or that a Vibro-Axe has the Vicious 3 quality. FFG even makes NPC management easier with their Adversary Deck. I've now got over a hundred adversaries on playing cards that I can dig through and slap onto the table as needed. The game system is so flexible that at a glance I can even add abilities and effects to the base card stats and my PCs are none the wiser. I theoretically COULD just sit down at a table with no prep-time or pre-made adventure and ask my players "okay, what do you do? ", and generally speaking I could make up the adventure on-the-fly. 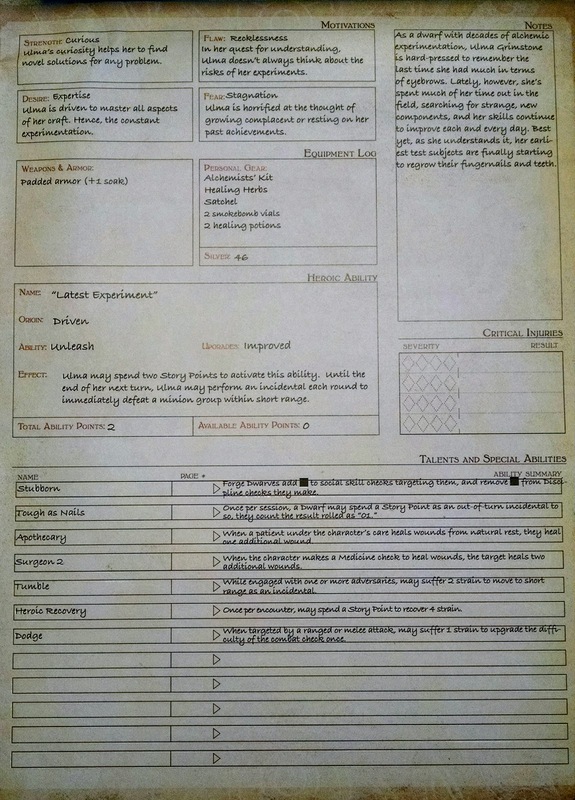 The harder RPGs to run are those that require a lot of chart-reference. Earthdawn comes to mind, as that game as a "Step" system that determines how many dice you roll. I got a lot of practice with that, but it's a lot harder to remember what you roll for Step 16, or Step 21, or 32. If a lot of bookkeeping is needed to play, that's a lot harder to keep up with while trying to keep the game going. 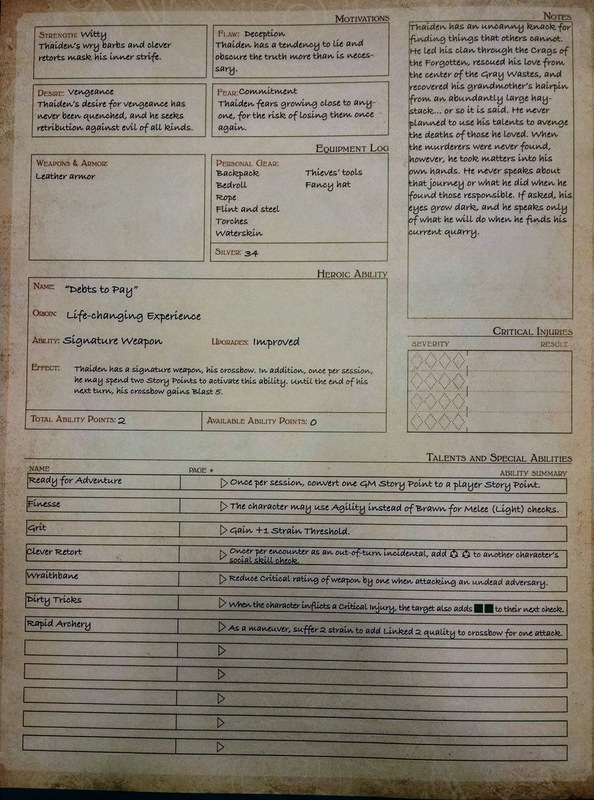 Critters with massive amounts of hit points with a novel-length list of abilities can be very daunting to try and keep track of while you're trying to keep the action dynamic and exciting. You can totally kill your momentum by having to pause for 30 seconds while you figure out what a dragon or a beholder is going to do next. I have a hunch tomorrow's question is going to be fun to write, and not in the way many folks are expecting. I anticipate that two or three of my friends will read it and have reactions like "...they WHAT?!" 19: Which RPG features the best writing? Okay, before you all start rolling your eyes, I'm going to clarify that statement; West End Game's original D6 based Star Wars RPG. It had a lot going for it. 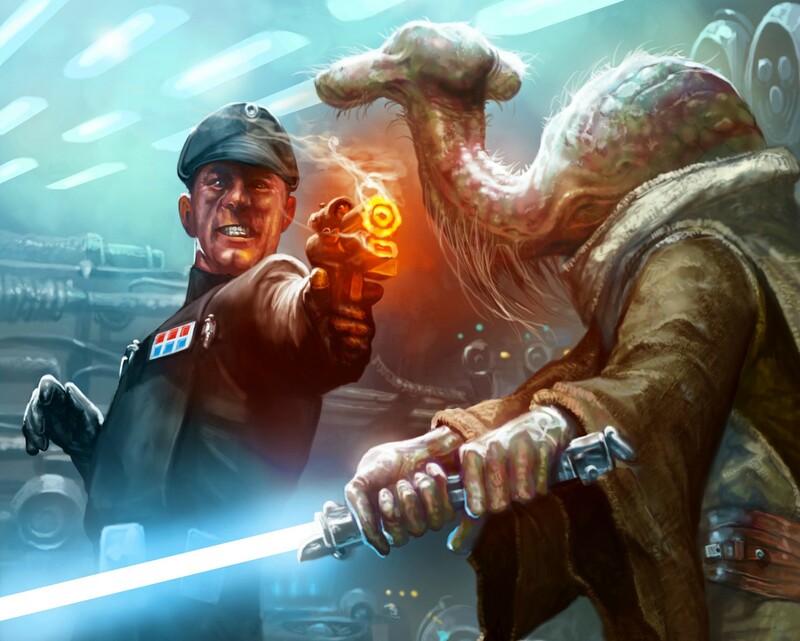 First of all, as I learned again while watching the "30 Years of Star Wars RPGs" panel at GenCon this year, a lot of what the WEG Star Wars game did was fill in a lot of gaps in the movies from an information standpoint. Until the RPG came along, there were no twi'leks, rodians, or ithorians. No one knew Sienar Fleet Systems made the TIEs, or Koensayr the Y-Wings, or INCOM the X-Wings and Snowspeeders. The name "Kuat Drive Yards" meant nothing, and didn't immediately bring to mind giant 2 kilometer long, triangle shaped warships. The RPG team and the developers on it created terms and ideas that are now used in Star Wars writing today. The gaming books that were written were designed from the standpoint of "we're the only ones making anything Star Wars right now, let's make it good." Sourcebooks such as Cracken's Rebel Field Guide and the Imperial Sourcebook are resource goldmines for every game and camapign that came after it. Out of the WEG Star Wars line came original work by folks like Pablo Hidalgo, Timothy Zahn, and Michael Stackpole. 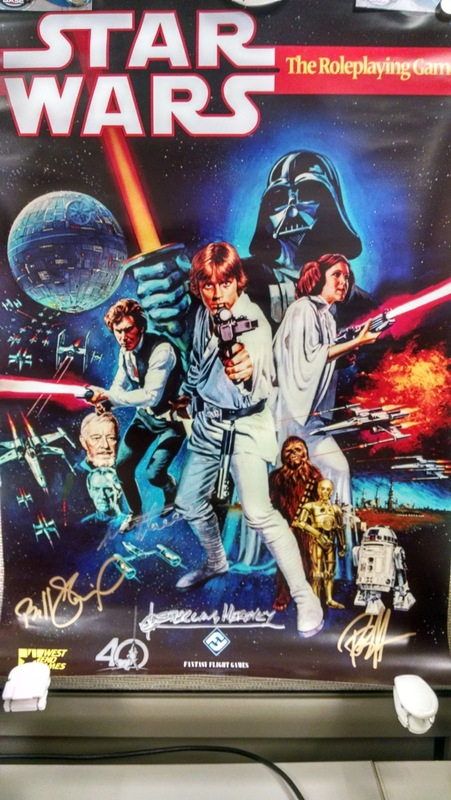 Suffice to say that the Star Wars we know today would not have been possible without the work of Bill Slavicsek and his writing team at West End Games. One of the highlights of my week at GenCon was listening in on his panel and hearing the stories about the early days of Star Wars gaming. Shaking his hand afterwards and giving him an enthusiastic "thank you!" was a bonus. 20: What is the best source for out of print RPGs. If you don't mind them being PDF copies, I have to direct folks to DriveThru-RPG. They've got quite a few games that have given up the ghost and faded into almost-obscurity. I'm sorely tempted to pick up a pdf copy of Mekton Zeta and Mekton Zeta Plus, just to have them on my tablet. 21: Which RPG does the most with the least words? I'm going to have to go with Lasers and Feelings. 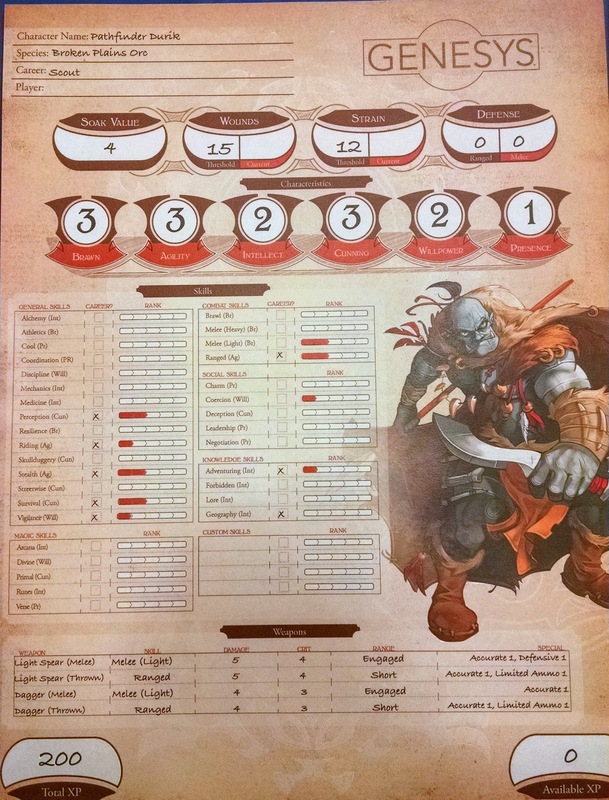 You can't get better than a one-page RPG that basically does it all for playing a "Not Quite Star Trek" game. 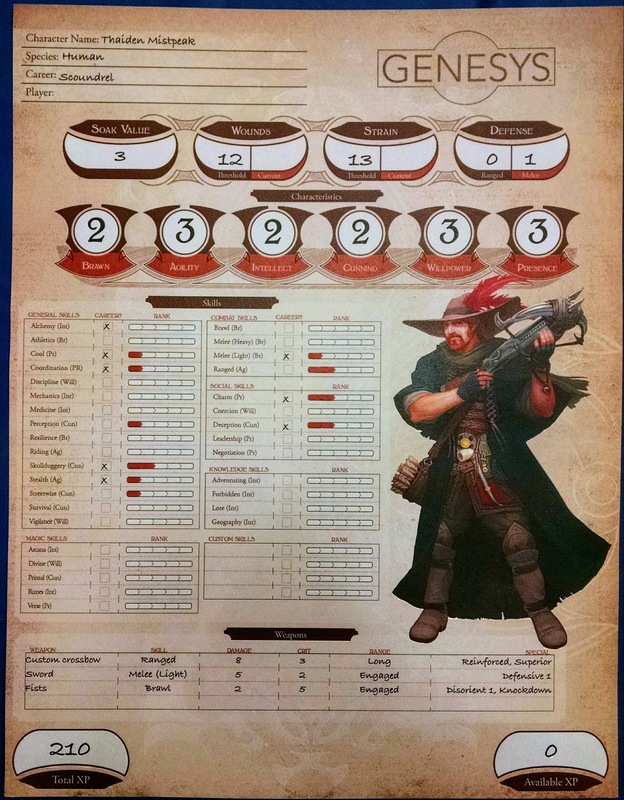 Speaking from a traditional published-work perspective, I'll probably look to Savage Worlds and FATE Accelerated. These two books are tight, digest-sized RPGs that can handle just about any genre or game as-is. Sure, there are expansion books that flesh out a lot of the details and give players expanded rules, but you really don't need them if you want to play a steampunk game, or a sci-fi game, or a fantasy game. All the rules you need are in those books, and the rest you can build off of them. And with that, we're caught up to today. Tune in later this afternoon, when I answer the Day 22 question "Which RPGs are the easiest for you to run"! Still in the airport in Indianapolis, still trying to get caught up on this exercise. No plan survives contact with the enemy, and there is extensive evidence to support that no RPG survives contact with the gaming public. Gamers across the internet are constantly posting changes they've made to make their well-loved games "better". I'm guilty of it too; I've made some self-determined "fixes" to my beloved Star Wars RPG. When recovering strain at the end of encounters, I allow 2 Advantage to heal 1 strain. In space combat, I allow pilots to take a "Snap Roll" reaction to reduce the damage from a successful hit by the pilot's Ranks in the Piloting skill plus the Handling of the vehicle. I had a bevy of house rules for previous editions of the game, and for most games I've run in the past 10 years. But the one RPG that I didn't really make any changes to (at least that I can recall) may surprise some of you; Heroes Unlimited. Yup, a Palladium Books game with their broken system and all; I ran a campaign in that system relatively straight out of the rulebook. The rules in HU weren't as broken or over-the-top as RIFTS, so it didn't break down with excessive amounts of attacks and die rolls for combat. My players and I got a good 2 years out of that system and that campaign, and we did it without any changes to the rules presented as written. You know, at first I thought this was going to be a tough question and then I remembered something I inherited from my grandmother when she passed away in 2004. My grandma, known in Sci-Fi circles as "Grandma Trek", would often receive books, magazines, and other periodicals from publishers. One item she received was the universally panned The Adventures of Indiana Jones Role Playing Game. The game is just...awful; so awful that TSR's celebration of the license lapsing and their ability/obligation to burn every remaining copy led to the creation of the "Diana Jones award for excellence in gaming." Every other game I owned that have never thrown down on the table has been given away or sold, so by default the Indiana Jones RPG wins. Day 18: Which RPG have you played the most of in your life? That's a really tough call. It really comes down to what the limit is. If we're sticking with one system and one edition, it's probably going to be Dungeons and Dragons 3rd Edition (and I'll include 3.5 Edition in that). I ran many a game and many a campaign for a solid 8-10 years using that system. I don't think I was able to run any specific edition of Star Wars for that long. However, if you're opening up the definition to all editions of the game, then it's Star Wars hands down. 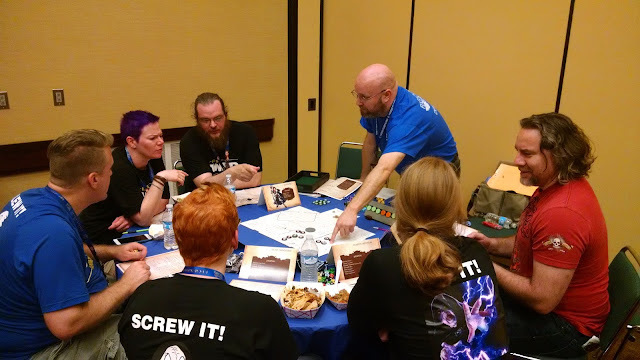 I attended a panel on Saturday at GenCon that talked about the 30th anniversary of the Star Wars RPG license, and I've been gaming in that system since West End Game's 2nd edition of the rules. That's at least 25 years of gaming in the Star Wars galaxy. No wonder I'm such a Star Wars nerd.